By the time he left the Slade in 1913, Bomberg had established a reputation as a leading member of the avant-garde. His work was admired by the Vorticist leader Percy Wyndham Lewis and he was among the non-members invited in 1915 to show work in the first Vorticist exhibition (although he was always careful to retain his independence). The previous year, in 1914, Bomberg had exhibited five works at The London Group (of which he was a founder member) and also held his first solo show at the Chenil Gallery, Chelsea. However his enlistment in the Royal Engineers (he later transferred to the 18th King’s Royal Rifles) in November 1915 brought this audacious progress temporarily to a halt. In March 1916 he married his first wife, Alice Mayes, and shortly afterwards was sent to the Front. His harrowing experiences including the death of his brother eventually resulted in him shooting himself in the foot. Escaping court martial and temporarily invalided out, he was soon returned to active service. In 1918 Bomberg was commissioned by the Canadian War Memorials Fund to produce a painting of Sappers at Work. His first, severely abstracted version was woundingly rejected and although the second, more naturalistic version was accepted, the experience left Bomberg severely demoralized. In Ghetto Theatre, set in Whitechapel’s lively Pavilion Theatre, where the classics were performed in Yiddish, Bomberg returned to the subject matter and setting of a number of his earlier sketches. Possibly, he hoped to recapture something of his earlier exuberance. In contrast to his animated prewar theatre-goers however, these drably-dressed spectators with their mask-like faces and closed body language are indicative of his dismal, postwar vision. 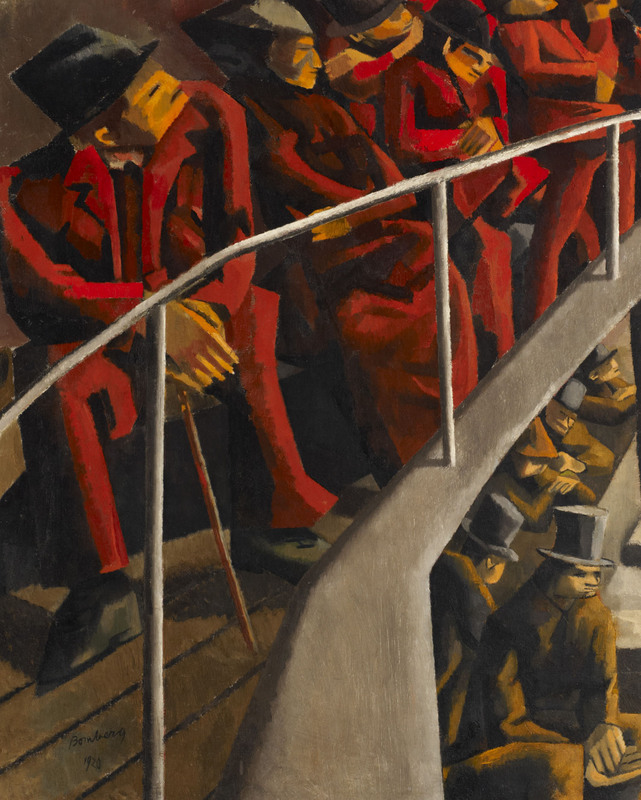 The hunched male figure (in the upper foreground) leaning wearily on a stick embodies his own personal disenchantment and the compressed space, cleaved by a bold and imposing balcony rail, echoes the claustrophobic tunnels of his wartime sappers. Only the bold sweep of red adds richness to an otherwise sombre palette. Painted on the eve of his departure from the East End, it reveals that for Bomberg, it was no longer a place of excitement and vitality. Yet elsewhere in a series of related Ghetto Theatre sketches, the artist’s looser handling once again liberates his audience from their constraints. In 1923, to escape poverty and neglect in England, Bomberg accepted a post with the Palestine Foundation Fund, who paid for his voyage in return for a number of works featuring Zionist reconstruction work. He remained in Palestine until 1927, travelling widely in the 1930s with the painter Lilian Holt, who became his second wife. Ghetto Theatre was one of Ben Uri’s earliest purchases, acquired immediately after its showing at The London Group exhibition in 1920. Bomberg remained deeply involved with Ben Uri from this time onwards, including lecturing on ‘Palestine Through the Eyes of an Artist’ after his return to England in 1928. Among Bomberg’s 14 works in the Ben Uri Collection are two pencil studies and one oil and pencil study for Ghetto Theatre, the latter gifted by his widow, Lilian, in 1959. Ghetto Theatre was shown at this exhibition in 1925. This portrait by Bomberg depicts his close friend and fellow ‘Whitechapel Boy'. Work by Bomberg's second wife, artist Lilian Holt. Work by Leon Kossoff, who attended Bomberg's evening classes (1950–52).